What is E3 without a little healthy speculation? At Oculus’ consumer Rift announcement on Thursday there were a number of questions still left unanswered. Like what will we do about occlusion with the new input (somewhat answered)? Or, what is the tracking volume? But there was one question in particular that had me scratching my head – what is the cord running from the Rift to the computer? On my way out of Oculus’ event I happened to check out the Rift they had on ‘guarded’ display (quotations only because I am sure that about 99% of the journalists could have absconded with Rift if someone had yelled “squirrel!” loud enough). Walking around to the back to take some lens shots I noticed the cable on the device was actually present – something that we haven’t seen on any of the display models (something that may need to be addressed – the wirelessness of the headset in public appearances so far might confuse the uninformed). But the end of this cable had been clipped. Why? What could Oculus be hiding? Let the wild speculation begin. Well – we don’t know for sure (yet) but we are willing to venture a guess that would seem to make some sense. 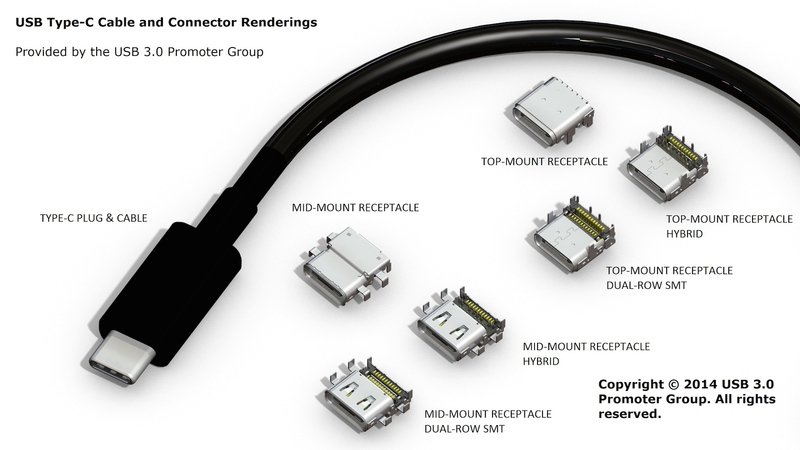 What if the consumer Rift were to make use of the new USB Type-C connector? There are a number of reasons that this would make sense – first of all the Oculus Rift is the computing device of the future, and USB C promises to become a future standard – or at the very least Apple sure seems to think so. The new standard comes with it a number of pretty major advantages – namely the ability to run both a strong current of power. A standard USB 3.0 can typically put out about 4.5 watts, the average laptop charges on about 60 watts, USB type C? Up to 100 watts. Thats a significant difference in power output which is made even more fascinating by the fact that the USB Type C cable can simultaneously transfer audio and video as well. And not just any video either – up to a full 5K. Oh yeah – it also has the ability to transfer data at a blazing 10Gbps – which is faster than Google Fiber, and double the current USB standard. Did we mention it is reversible too? Cause there’s that as well. There’s a reason why this is being called the cable to end all cables – because it has the power to be. If the cable on the new Rift is USB Type C it would help explain the single cord. There is also always the possibility that the cord at the show was simply clipped before the splitter box that was present on the DK2 – which tethered the headset to the positional tracking solution as well (no word yet if the headset and Constellation tracking will have to be physically connected). We have attempted to get Oculus to comment on the USB Type C situation before, but were rebuffed at the time – we hope to be able to get a little bit more out of the team this time at E3. It is worth noting that Palmer did excuse himself extremely quickly when we asked the question before at SXSW – but that is hardly confirmation. Even if they won’t talk – our eagle eyes hopefully will be able to spot the connectors at the back of the device when we go hands on with it in the morning. We will be sure to update with more info as it becomes available.